As the public teaching hospital for Dallas County, Parkland is committed to helping health care professionals in their pursuit of continued education and career development. It is in the best interest of the community and the patients of not only today, but those of tomorrow, to offer training and educational opportunities. There were 1.1 million job openings in the healthcare industry at the end of 2016. At least 150 Parkland employees are expected to access training and education services in the next 3 years. Education at Work currently has 30 active participants with plans to increase by 10 prior to the Fall 2017 semester. 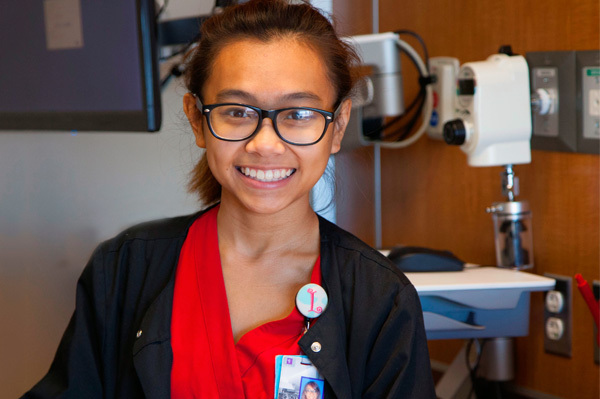 Rise to Success Youth Program is designed to provide both an educational and employment opportunity for recent high school graduates who have an interest in pursuing a career in the health care arena through the Dallas Community College District. Participants complete 10 weeks of training to earn a Patient Care Technician or Medical Interpreter certificate. The program also offers part-time employment at Parkland. Education at Work provides job skills training and educational opportunities to eligible Parkland employees, allowing them to learn while continuing to work to support their families. In addition to helping participants with tuition and books, the program offers “wrap-around” services to help them overcome some of the barriers to continuing their education, including childcare, transportation, career coaching and financial literacy. Your gift in support of workplace education at Parkland will help us continue to build a foundation of health care professionals who understand what it means to be servant leaders, provide the highest quality of care at Parkland and beyond.